The Christmas tradition of free bus travel in Auckland came abruptly to an end this year when posters in buses announced a reduced timetable service, plus no free travel as normal fares apply on the day. NZ Bus blames the economic situation this year and one must not be a heartless cynic suggesting it's aimed to clawback some losses from the lock out earlier in the year, perish the thought. NZ Bus has a 20% return on capital to recover for Infratil, after all, so no more festive rides, thank you very much. Needless to say Christmas traditions have never been Fullers forte: I can't remember there ever being any festive cheer in the form of discounted travel on the ferry or the Waiheke bus at Christmas. The Auckland Regional Transport Authority (ARTA), in conjunction with its partner Thales and its funders the New Zealand Transport Agency (NZTA) and the Auckland Regional Council (ARC), today signed the contract to deliver a super transport ticket for Auckland. The ticket will be Auckland and New Zealand’s first, true multi-modal transport ticket. Thales’ strategic partner of Hong Kong’s leading contact-less smart card payment system, Octopus will supply the core central clearing house system. This is very important news for regular users of public transport in the Auckland region. It is a seamless, electronic ticketing system that lets you use all transport modes at all times for the cheapest fare going, and, hopefully, at a daily/weekly/monthly capped rate. $5 to $10 a day for all your public transport needs sounds about right. We will have to make sure that Fullers Waiheke service and the Waiheke Bus is included in the system. Read more about Hong Kong's Octopus card system here. A useful background to the proposed Auckland system, and an opportunity to discuss it can be found here. But feel free to discuss the Waiheke situation and place in the system here. 2. Why not set up ARTA as a “Pharmac for public transport”, i.e. a bulk purchaser of public transport on the passenger’s behalf? Fares could then be set as a flat fare (or even free for Auckland City residents) for a yearly card. 3. I have personally major concerns, as a Waiheke Islander, that our local transport monopoly provider will do all it can to avoid fare capping or charge a fare comparable to other (subsidised) zones in the city. Fullers has been re branding itself as a tourist service instead of a public transport service with boats routinely taken out of commuter service to ply the charter trade. Commuters are seen as a useful nuisance (as a good cashflow provider in winter) but the $32 return tourists and dirty weekenders are Fullers real market. The Oyster system needs to make sure that ALL transport modes in Auckland are included with the same terms and conditions. 4. A useful price comparison: in Switzerland the national railways company offers an annual season ticket valid on all trains and local transport (buses and trams) in most cities and regions for the price of 3,100 Swiss Francs (NZ$2,250). 12 monthly passes on Fullers cost NZ$3,780. Some of us, as noted before, are commuters on the weekend too. Fullers prefers to be a tourist service on the weekend so timetabling is much altered to suit weekenders, holiday and merry makers, and commuters are very much an afterthought when it comes to taking them to town in time. Now a few weeks ago the 8am weekend sailings from Waiheke have started to call in at Devonport. Heaven (again) knows why since barely anyone got off or on at those stopovers, but results in major delays in getting into Auckland. Since the bus services on the weekend are depleted as well, the connections are even more challenging to get to work on time. One of my fellow commuters suggested to the captain to make an announcement on board instead asking passengers who want to go to Devonport to make this know to the crew, otherwise they just chug on to Auckland. After some correspondence with Fullers management this has now been taken as policy. Cheers, Bill. Every Wednesday (only the Fullers Gods know why) the QuickCat chugs along to eventually do the 8am ex-Waiheke service. The boat never arrives on time and never leaves at 8am, and thus never gets on time to Auckland to connect with the usual other transport modes. The old lady seems to be knackered, when even Jet Raider can maintain a semblance of meeting a published schedule. Why they keep flogging QuickCat into doing a service it's obviously not up to is a complete mystery. Getting on the bus from Matiatia home last night yielded some walking exercise for many people as the bus engine died at the Art Works bus stop. The driver had to call in technical assistance, but I and quite a few others didn't hang around to see how it got solved. Waiheke is the confirmed place that buses come to to die. As flagged for a while by Fullers, now Waiheke and Half Moon Bay monthly ferry pass holders can use the Howick & Eastern Bus services too. Fullers sale by Infratil to Souter Holdings, owners of the H&E Bus company, last April made this an easy thing to do. Fullers Group Ltd announces a new customer benefit for Waiheke Island and Half Moon Bay commuters. From Tuesday 1st December, the Fullers monthly pass for Waiheke Island and Half Moon Bay will include an additional benefit of being able to travel on all Howick & Eastern Bus services without having to purchase another ticket. The Waiheke Island and Half Moon Bay monthly passes can be used for travel across all Howick and Eastern routes and services at any time. Customers simply need to show their current Fullers monthly pass to the bus driver to so that the journey is recorded and Howick & Eastern can charge the journey back to Fullers. This initiative is symbolic of Fullers drive towards an integrated fare structure. It is hoped that the benefit will open up a wider opportunity for commuters in the Half Moon Bay area who will now be able to more easily combine bus and ferry travel to and from the city without the requirement for separate tickets. Waiheke commuters are currently able to use their monthly pass on all Waiheke Island and NZ Bus services and now have the advantage of being able to travel to onward destinations around Auckland served by Howick and Eastern buses. Douglas Hudson, CEO, Fullers Group says, “Fullers is pleased to be able to offer another product which demonstrates our commitment to integrated ticketing. For many years we have been offering the Go Rider pass which can be used on North Shore – Downtown ferries and NZ Bus services in the Auckland region and we have now seized the opportunity to develop another product which will benefit our Waiheke Island and Half Moon Bay customers." How much Waiheke pass holders will use this extra service is questionable because if you worked in East Auckland, you take the Kennedy Point ferry to Half Moon Bay instead of having to come into town first to then trek all the way east on the big brown bus. The NZ Bus lock out last month has resulted in a refund offer from the company to season ticket holders. Since Fullers Ferries monthly passes include an all-zone monthly bus pass, Waiheke Islanders can apply too. Just fill in your monthly pass number. If they refuse, email them that Fullers CEO Doug Hudson his company pays NZ Bus for Fullers monthly pass holders using NZ Buses in the city and are thus deserving of a refund like their other customers. UPDATE 21 November: I got my $25 refund in the bank. Which values the Fullers monthly pass at about $100 a month. Considering it allows travel the equivalent of an All-Zone NZ Bus pass (at $175) Fullers gets a substantial discount on NZ Bus fares. The Auckland Regional Transport Authority (ARTA) says it is delighted the New Zealand Transport Agency Board (NZTA) has approved funding today to move forward on the development of an integrated ticketing and fares system for Auckland’s train, bus and ferry users. ARTA’s Chairman, Rabin Rabindran says, “ARTA is delighted with this news which means we can now move to finalise contract negotiations with our preferred tenderer, a consortium made up of French electronics company, Thales, in partnership with the Bank of New Zealand and Transfield services. “This is a critical and long awaited next step for Auckland’s public transport system doing away with a multiplicity of ticket options and opening the door to greater ease of use for our customers with a single ticket. “For ARTA an integrated ticket is a pivotal investment in the future development of Auckland as a city which ultimately wants to stand on the international stage as having world-class levels of transport in all respects. Mr Rabindran says, “We look forward to assisting NZTA as they develop a national integrated ticketing system to benefit public transport users throughout New Zealand through our delivery of an integrated ticket for Aucklanders”. We will have to make sure that Waiheke Island's transport is included in the system, and at equitable rate as other Aucklanders living the same distance from the CBD. Well, for a start it really does seem as though Infratil was completely lying when they said they would accept that decision, and have subsequently been pushing the case (again) that Snapper should get the contract for integrated ticketing, rather than Thales. Secondly, the decision by ARTA and NZTA to choose Thales as the preferred supplier of Auckland’s integrated ticketing system is separate to NZTA’s decision to stump up the necessary funds to actually carry out this project. This second decision was meant to be made by NZTA some time within the last couple of weeks at their October meeting. My understanding is that the meeting took place, but no decision has yet been released. The case in favour of an independent integrated ticketing operator (independent from the transport providers) collecting fares from passengers and distributing funds to operators, was pretty well made during the recent NZ Bus lockout. Imagine if the lockout had applied to the Infratil Snapper system workforce too, how would any public transport in Auckland have been possible for the 7 days of the lock out? Waiting passengers, staff and local residents watched as one of the island's passenger ferries limped into Matiatia with plumes of white smoke billowing from its bow. While waiting for the fire crew to arrive, Fullers Ferries' staff member Jim Hannan cleared the wharf and waiting room, ushering customers to the safety of the car park, just after 1.30pm on Monday. "I was on my way home when I heard a bang and saw smoke coming from the Starflyte as she came round the corner of the bay," says Mr Hannan. "So I got everyone to the car park." Fullers' operations manager Ian Greenslade says on board the ferry, crew had noticed a loss of power as the vessel came through "the heads" - and smoke in the cabin. Staff moved passengers to the outside top deck while a deck hand put out a small fire in the engine room with a fire extinguisher. Once alongside the wharf, passengers were evacuated and fire crews from three fire tenders took over, opening vents to cool down the engine room. Maintenance personnel from Fullers arrived and, according to Mr Greenslade, were able to take the Starflyte back to Auckland using one engine, with initial tests showing a problem with the vessel's turbo charger. A replacement boat from recently acquired 360 Discovery was used to transport the waiting passengers to Auckland. Mr Greenslade says the Starflyte will be out of action for around a week while parts are flown in from Switzerland. Meanwhile the Quickcat, which has been out of service on survey, is due back this Friday. The dear old Starflyte obviously isn't up to doing the long Matiatia runs intensively. Fullers has cancelled all sailings from noon today until further notice due to a tsunami threat after the eartquake in Samoa. It is unclear why Fullers isn't using their txt message system. It's been ages since I last got a travel update via txt. Matiatia wharf was evacuated twice with all passengers transported up the hill to Oneroa. UPDATE FROM FULLERS: Text alerts have been sent this morning at 9.58am and 11.53am to passengers who have registered for "off peak" messages. At this time based on advice received from Auckland Harbour Control, the Auckland Harbourmaster’s Office, and after liason with ARTA, all Fullers services are suspended until the Tsunami warning is officially lifted by these maritime agencies. 1.30pm UPDATE FROM FULLERS: Following advice given by Harbour Control and the Harbourmaster’s Office, we will now resume all services as quickly as possible. 5pm UPDATE FROM FULLERS: Following advice given by Harbour Control and the Harbourmaster’s Office, all services resumed at 1.30pm and have been operating as normal since this time. No more updates are anticipated. To provide clarification, when customers sign up to receive text alerts they join groups which are most relevant to the times they travel. This is so that we do not over deliver irrelevant texts to uninterested parties and at times when travel notices are unwanted. In the instance of today’s text alerts relating to the tsunami warning and service cancellations, the text messages were sent to the INTER PEAK groups. Rumour has it that Fullers Ferries will end the integrated ticketing arrangement with NZ Bus and the Waiheke Bus Company at the end of October, despite assurances given at the time the company was sold to Souter Holdings in April. Currently, Fullers monthly pass holders can use their pass on all three transport providers in all zones and at all times. - current monthly pass holders, who will have to re-assess their travel arrangements, figuring out what their best option is for their particular circumstance and travel needs. Options include switching to 40-rides or workers' weekly tickets for the ferry, Go Rider cards for NZ Bus and season tickets or multi-rides on Waiheke Bus. - Waiheke Bus Company: it will lose commuter patronage as it may be cheaper to go by car to Matiatia (or carpool or kiss & drop). Fares may have to rise to compensate for lost patronage. On the other hand, it could make arrangements with future ferry service providers as it would no longer be tied to Fullers. - ARTA's attempts to go to a city-wide public transport integrated ticketing system. It's one further move in the "balkanisation" of public transport in Auckland where operators charge their own fares, set their own conditions, run their own timetables and decide on their service delivery. - Any new entrant on the Auckland-Matiatia ferry route: the season ticket playing field would be levelled by this move by Fullers, enabling new entrants into the market (and possibly leading to lower fares overall - now there's hoping!). Commuting by car ferry to Half Moon Bay might now even become more attractive and viable too. The effect on Fullers could be mixed: some commuters might opt for the 40-ride instead of a monthly as it gives more flexibility on travel, number of people who can use the one ticket etc., but earnings per passenger would increase for the company. Demand, of course, could drop off with people opting to re-arrange their travel needs, move off the island (especially students) or use the competition (either Sea Link or any newcomers) as Fullers has given up a powerful commuter loyalty tool. - $26.50 for a 4 stage 10 ride on Waiheke Bus (no season tickets available). UPDATE 1 OCTOBER: In an interview with the Waiheke Marketplace newspaper this week, Fullers CEO Doug Hudson said that "past arrangements [when Fullers and Stagecoach were both owned by Infratil] may end should the ex-owners choose". Does this offer Fullers a handy spin out of having to take the rap when NZ Bus "unilaterally" pulls out of the agreement? We are still not reassured the current integrated ticketing scheme will remain in place, despite a possible link up with Howick & Eastern Bus instead (also owned by Souter Holdings). This link up would really be very useless because those buses only go to the eastern suburbs. If you had to commute there, you would save yourself a massive amount of time by going Sea Link instead. - The current 7.20am departure from Matiatia will depart at a new time of 7.15am, Monday to Saturday. - The current 6.30am service departing Downtown Auckland to Matiatia will depart at a new time of 6.25am, Monday to Saturday. - The current 5.35pm departure from Matiatia will depart at a new time of 5.40pm, Monday to Friday. The change to the time of these services is in response to feedback from the Waiheke Ferry User Group, Waiheke customers, and also to reflect a more accurate actual departure time. It is anticipated that with the adjustment of these times, customers will be able to connect more easily to onward transport (i.e. buses and trains) upon arrival into Auckland. Nothing earth-shatteringly different, and it's good to see timetables being adapted to real earth time rather than hypothetical Fullers time. Nothing radical is in the works though, such as a half-hour frequency in the evening rush hour by adding a 6pm ex Auckland sailing. They have barely got the boats to the current timetable, let alone one that would really benefit commuters. We'll have to wait for Catamaran International to plug that hole in the schedule. UPDATE: Not only the early morning ferry timetable is changing, but the bus times are too. So get yourself to the bus stop at least 5 minutes earlier. I hope the crack communications team at Fullers will get the word out sooner rather than later. (Matiatia counter staff didn't know anything about it and had to consult the bus driver who happened to hang around) Which reminds me that I haven't had any travel updates by txt from Fullers despite the recent spate of boats running late. The Auckland Regional Transport Authority (ARTA) has released its Monthly Business Report [PDF] for the July 2009 year. On Page 4 is a graph of total patronage on various transport modes over the last 7 years. Ferry patronage is static despite seasonal wave movements between 300,000 and 450,000 passengers a month. Looking at a past 4 year period (page 8), July 2008 was the third lowest in numbers over the period, which puts the 11.8% rise in 2009 into context. Also it seems that the introduction of the Supergold Card free travel in November 2008 has cushioned the (mostly) downward trend in passengers in 2007 and 2008, with stronger than normal seasonal figures in 2009. The Government has saved Fullers' bacon, but we are still paying higher fares. As an aside, the ARTA report doesn't research punctuality for ferries, because Fullers is exempt from that criterion. Only after a week back on the run, Superflyte's propeller hit something in the water yesterday morning so it will have to come out to be repaired, goodness knows for how long. It's not shaping up to be a good start to the tourist season for Superflyte! Fullers announced that Quickcat will go on its annual survey from tomorrow, Thursday, "for 3 weeks". I trust the Fullers definition of "week" in not the same as the "2 weeks of survey by Superflyte", which turned out to be 2 months. In the meantime, we can again look forward to that old lady of the Gulf, Jet Raider, providing service again, like every Winter. Both sides lifted their notices of industrial action after a mediation hearing in Auckland this afternoon during which the bus company made an amended pay offer to staff. I had expected to walk the 5km to work from the ferry terminal tomorrow morning, but hey, it's going to be a glorious day again and hopefully without the fog which made the Superflyte take an hour to get into town this morning. A, to my knowledge and experience, first for Fullers: a free drink for passengers, on the house! This was on the 5.30pm sailing from town and offered to passengers for putting up with the wafts from Satan's bottom on Superflyte. The incident making the national newspaper obviously caused some scrambling for damage control. I'll be calling Superflyte "Auld Reekie" from now on. Yesterday Superflyte came back into service after a two month survey, which was originally planned only to last two weeks. There was obviously more wrong with her than expected, but since she is ageing a bit it's not that surprising. Anyway, a warm welcome back, and enjoy her while you can because that other old lady in Fullers' fleet (is Quickcat Kashin to Superflyte's Burma, I wonder) is on the slip soon for heaven knows how long and then we can again endure everybody's favourite vessel Jet Raider. Nothing much new on Superflyte apart from a scrub on the outside and a few new flash TV screens inside. They were not in service so far and some are used to promote bar products. Everybody was welcomed back by a terrible stench on both floors, the engineers must have hooked up the aircon to the bilge. Even the staff apologised on the tannoy, so it must have been serious! Passengers were also warned to be on time to buy their monthly passes since "boats will leave on time because there have been complaints about lateness in arrivals". Nice to know that somebody in Fullers management reads this blog! Ructions on the 4:00pm from the city this afternoon. I was on this boat myself today. A well known loud abusive drunk was allowed on board. Ray K was furious about it and remonstrated with the captain for letting him on. He had a real go at him about it. He's well known to Fullers apparently with meek and mild behaviour before he gets on and then he rips loose once he's firmly set foot onboard so Ray reckons they should never have let him on in the first place. I noticed on the bus a flyer announcing weekly Go Rider passes from 30 August available for $40 a week. I haven't seen it announced on the Maxx website. $40 a week for all your public transport needs with in the Auckland super city, cheap and easy to understand, buy, validate and use. No need for zoning, no discrimination between transport modes (valid on buses, trains and ferries, including Waiheke) and times of use. The big news this week, actually the one of the biggest news items on the Waiheke ferry front for a decade, is the impending launch of a competing fast ferry service to the CBD by Catamaran International. The company plans to use their 20m catamaran on a full range of ferry services throughout the day and cut Fullers' current fares by 11-20 percent. Initially, they expect to be able to attract about 10 percent of Fullers’ yearly 1.3m Waiheke passengers. Mr Kemp says operators that have competed with Fullers have been unable to sustain a service long enough to become viable. However, previous competitors have used similar sized boats to Fullers, he says. There have been many rumours over the years of a competing service but this one looks quite serious, even if it's not expected to start soon and then quite modestly with a single vessel. As islanders, we of course look forward to a competitive service, certainly on speed, price and service, three things they are promising to deliver. So we welcome them warmly and wish them the best of luck with the venture. I've been away last week so no updates available since then, sorry. A whole week I couldn't use my monthly pass due to a family emergency. It just shows that weekly passes (even daily ones) should be available from a date you choose insted of being locked in an expensive monthly flat rate contract. Anyway, back at work now. Tue 18 Aug was a shocker of a morning: 8:00am Jet Raider arrived at 8:52:16. Wed 19 Aug was only marginally better: 8:46:15. Sun 23 Aug saw a 8:33:32 arrival time. Well done, Starflyte captain. I never thought I would see those three words together published in a newspaper in my lifetime, but there they were: a shiny advert in the NZ Herald offering Auckland commuters the experience of travelling to and from work by ferry, and for free for a week in September. If you want to take advantage of this Maxx offer, register here. But don't bother if you want to commute from Waiheke. Our route is the only one excluded from the offer. You see, we don't need convincing we should use ferries to work, we already do. Some of us have been doing this for 27 years, as was recently impressed on me by the FUG lady. So, Devonportuguese, Half Moonies, Bayswaterholes, Stanley Bayers, Birkenheadcases and Northcoteries, congratulations with your good fortune. But do think about those who will pick up the tab for your luck: a free week's travel (and massively subsidised runs afterwards) thanks to the Waiheke commuter who is paying over the odds for the whole system to prevent it from collapsing. Fullers, of course, will pay nothing. It's Maxx (the Auckland region ratepayer) who will. The success of a government pilot project aimed at lowering ferry fares in the Outer Hebrides has sparked a fresh call for reductions elsewhere. Fullers owner, Mr Souter, is a Scotsman, so why not follow their shiny example? A pilot scheme offering lower fares on all ferry routes to the Western Isles has increased traffic significantly, the first minister has said. Road equivalent tariff (RET) was launched by the Scottish Government in October last year. It bases the cost of travelling on the equivalent distance by road. Alex Salmond said since the scheme started there had been a rise in the number of visitors, family, friends and businesses visiting the isles. The B.C. Ferries annual report is grim reading for individuals and business owners in coastal communities. In the last year, the number of vehicles carried has fallen by more than five per cent. The number of passengers has fallen by almost as much. The losses have been greatest on the major routes, carrying visitors to Vancouver Island. The annual report cites a number of factors, including the recession, high gas prices, falling tourism and December storms. All of those certainly played a significant role. The state Transportation Commission is recommending that ferry travelers pay a second surcharge during the heat of summer. For years, Washington State Ferries has raised vehicle rates 25 percent during the peak season, from May through mid-October. The transportation commission, after hearing Washington State Ferries’ proposal on July 14 to raise fares 2.5 percent across the board, decided to add a 10 percent super summer surcharge in July and August. Like the peak-season surcharge, it wouldn’t affect customers using frequent-user passes, just tourists and other occasional users. For them, the cost of a cross-Sound ticket for a car and driver would jump from $14.45 to $16 each way. The super surcharge would not apply to walk-on passengers. The inquiry is looking at the price of passenger and vehicle fares including fuel surcharges and freight charges. The responses have been excellent. Superflyte was supposed to be on survey for "2 weeks". It's now almost 5 weeks later and still no sign of her. I asked one of Fullers staff about it and he said: "Still some time away!" UPDATE: A notice on Jet Raider said Super Flyte will be back in service on August 24, its survey found malfunctions in its engine and parts had to be sourced in Australia. The planned survey of Quickcat has been postponed due to this. I would advise Fullers staff to pray Jet Raider doesn't cark it in the meantime. The old lady doing a 2 month run is asking a lot! And good to hear about plans to start a cheaper rival ferry service to Waiheke. Good luck to them, they'll have our full support, but we'll have to wait to see before it happens. Commuting on Sundays in Auckland is a challenge, what with a dearth of buses in town, K Road nightlife debris trying to get on the bus, trying to find the right change and trying to stay awake during the trip, it's life as you can see on no other day in town. But Fullers does a good job with hourly services, and Starflyte even arrived a minute early (8:33:50) so my congratulations. Please don't fine the captain for putting his foot on the accelerator. No how about a few more boats on Sunday night so a night out in town will be feasible? A flyer was handed out to passengers by ferry staff on Wednesday night - always an occasion for apprehension because it usually spells bad news of some kind, either boat breakdowns (Jet Raider gave up the ghost after two weeks during this year's Superflyte survey - surely a record!) or fare increase announcements. But no, instead it told us of the installation of a new feature on Pier 2: an electronic clock. The aim is to co-ordinate the boat clocks with the wharf clocks so everybody will know what time it is that the ferry leaves. Finally, 160 years after England standardised its timezone due to the arrival of the railway, Auckland ferry time clocks on board and on land will now be GPS controlled. How that will contributes to the sum total happiness of the population remains a mystery, but I can think of one useful feature: it will enable everybody to see, to the second, whether the Fullers publicity claim of 35 minutes to and from Waiheke corresponds with reality. On Thursday morning I arrived at 8.38.50, which is a 10% delay. Feel free to keep noting down arrival times and mail it to us. Arrival times are far more relevant to passengers than departure times since onward connections are made or lost by any delays. ARC chairman (and Waiheke Islander) Mike Lee heaped praised on the Auckland Regional Transport Authority (ARTA) and the New Zealand Transport Agency (NZTA) for achieving a break-through on integrated ticketing. ARTA and NZTA today announced they will work with an experienced French company, Thales, to develop a system for Auckland’s buses, trains and ferries. Mr Lee called integrated ticketing a “key piece in the public transport jigsaw” which would enable a quantum leap forward for Auckland public transport patronage. ARTA began the tender process for the ticketing system last year but it was delayed by an NZTA review, instigated in part by a rival tenderer. “Because of this, the technical work carried out by ARTA and the tenderer is now being picked up by NZTA as the basis of a national integrated ticketing programme, which will allow regions throughout the country to share costs,” Mike Lee says. Central and local government are sharing the project costs. In February, the ARC was looking at a capital investment of $32 million to fund the region’s share of the system, but Mr Lee said the final capital cost to Auckland ratepayers would now be very much reduced. However, the reduction would be “significant”. National application would be good as there is little to be gained from developing local unlinked systems when transport is integrated nationally. My idea would be to have a cap on your weekly spend on your public transport needs, say $50, which you would load on your "Orca Card" and swipe with whatever transport company you want and need to use within the Auckland region. The ARTA would then become the card fare collector and distributor of the loot to the transport companies based on the swipes they collect. (An analogy would be Pharmac buying drugs in bulk and thus suppressing the cost to the end consumer). It would be a transparent system, easy to use, would not lock you in for a long period, and thus attract far more customers than currently use public transport. The Supercity Select Committee hearing in Waiheke Island heard from a variety of islanders on a wide variety of subjects from waste to local community empowerment and public transport. ARTA – or whatever organisation replaces ARTA should be an independent body reporting to the GAC, rather than a department. Integrated ticketing needs to be a priority for GAC. This would allow a competitor to compete fairly on the Waiheke to Auckland run. At the moment, the commuters are the lifeline for Fullers. The monthly pass allows unlimited travel on Stagecoach buses and on buses on Waiheke, making it nearly impossible for another company to compete. We also need an affordability criteria and a look at standardising fares across the Auckland region – It shouldn’t cost as much to go 5 kms on Waiheke as it does to get from Auckland Central to Henderson. If the Half Moon Bay ferry is $13.40 return, why is a Waiheke ferry $32 return, for the same distance travelled? Secondly, ownership of the wharves needs to be clarified and a system whereby a competitor can be guaranteed berthage at competitive times. Thirdly, Waiheke needs an effective transport management plan which recognises Matiatia as a transport hub for islanders getting off the island as well as tourists trying to access the island. Transport plans have been made before but are not followed. Over the last 20 years people have been asking for a more flexible bus service - smaller buses with better coverage. It shouldn’t take 50 minutes to get from Rocky Bay to Matiatia, before you even start your journey into town. Also Matiatia is primarily set up for tourists and selling tours. The local population don’t need a flash terminal – they need a place which is safe and warm to wait, free parking within easy access to the wharf and a system with flexibility for the different users (people with bags, families with young children, cyclists and motorcyclists). A plan needs to combine the needs of all users but then needs follow through. Fourthly, we support greater autonomy for decision-making on Waiheke. The Auckland City Council continually fails to represent us or act in our interest. We would like a local council to have greater decision making powers in terms of infrastructure and transport decisions. They are a cross-section of elected representatives who live within the community and their authority should be respected. Local councillors and council workers recognise the importance of sustainability because they also live on this island. This carries through in terms of waste, use of water, management of septic waste. The more decision making that can be carried out locally, the better. The Select Committee hearing submissions the Auckland Council Bill arrived on Waiheke this morning, and I was pleased to see that the eminent MPs were treated to a ride on the Jet Raider. I imagine it was experience far removed from their spacious and comfortable seats in The House, and I hope it has imprinted on them what the conditions the hordes of commuters they encountered on the gang plank are faced with daily. C4FFF is making a submission in person to the Committee on public transport issues to be faced by the new Auckland Council. Maxx, the Auckland public transport hub and website, has launched a competition to come up with catchy slogans on why on earth you want to be on the bus instead of the comforts of your own car. It can include your own picture plastered all over the back of a bus if you are one of the winning entries to be published and driven around town. So it is also a good opportunity to make a little fun of Maxx and the dire state of public transport in Auckland. After all, the overwhelming majority of commuters use their cars instead of the inconvenient buses, creaky trains or expensive ferries. So get creative and enter some cringe inducing witticisms that should shake the transport regulator's complacency. - I pay Fullers $3,780 a year and I still can't get on this bus. - One ticket to go on train, bus and ferry. Old people can, why can't everybody else? Winter is upon us. You reflect while you are shivering on Pier 2, dark, windy and wet. Nothing much changes year to year in ferry transport, really. The old shelter sheds have been replaced by a cavernous, sails-inspired structure that protects nobody against the stiff northeasterly wind or driving westerly rain. To save on power only half the lights are turned on, which makes it too dark to read, even if your paper doesn't blow away. And you are not allowed to sit anywhere on the steely cold benches. No: for over a year there have been "structural improvements" going on on Pier 2 (I'm not talking the addition of a forlorn Esquire cafe hut). The amount of time it is taking to strengthen Pier 2 is not imbibing me with confidence on how long it will take to get Queen's Wharf up to scratch for the rugby party animals in 2011. And since it is that darkest period of year again, Fullers is treating us with daily rides over the coming weeks on everybody's favourite boat, the Jet Raider. The "Superflyte on survey" is an annual event to show its customers who really is boss, and if you dare to murmur criticism of inappropriate timing, daily lateness and uncomfortable rides in the said nor'easter, there is always the threat of a fare increase. Last night (Thurs 25 June) the 8.45pm Auckland to Waiheke ferry suffered a breakdown that resulted in pasengers being transferred mid-harbour to another ferry. The following is an eyewitness report from one of the ferry passengers. "It was a normal 8:45pm sailing and I headed upstairs on the Wanderer. Shortly after departure I popped down to the bar for the obligatory Merlot, Without warning I felt myself falling backwards as the boat suddenly lost all power. A cruise ship had just departed Auckland so I assumed we had slowed down to let it pass. You think something is wrong when the men with the stripes on their shoulders start running backwards and forwards, you know something is wrong when all the lights go out. I went back to my merlot, placed a few tweats on a rapidly flattening phone, observed other commuters texting and ringing loved ones, watched the cruise ship sail past; more men with stripes running backward and forward, now with torches, “shall I try restarting the genset?”, lights come on, drop anchor. The Seaflyte returning from Half Moon Bay pulled alongside, we transferred via the wheelhouse and on our way back to Waiheke. To the Fullers staff and crew: a big thumbs up for a well executed mid harbour manoeuvre in unusual circumstances and cheers for the free beer". 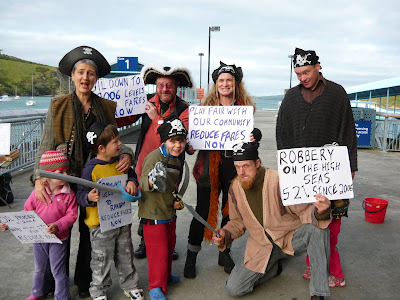 This Monday 29 June, Campaign for Fare Ferry Fares (C4FFF) will be presenting Auckland Central MP Nikki Kaye with a petition signed by more than 500 people, calling for accountability on the Matiatia to Auckland ferry route that is currently operated by Fullers (Souter Holdings). Nikki Kaye will be meeting with C4FFF on Monday and has agreed to present the petition to parliament on behalf of her constituents, as part of the discussion on the Public Transport Management Act. The petition, now signed by more than 1000 people, calls for a mechanism of accountability so that fares cannot be raised without consultation with the governing transport authority, and for regulation or fair competition on the Matiatia to Auckland route. C4FFF spokesperson Dr Cathy Urquhart says with the review of the Transport Management Act looming, this is a key moment to request regulation or accountability of some kind before more residents are forced to leave the island. C4FFF members will also travel in person to Wellington to talk to members of the Transport and Industrial Relations Select Committee when the Public Transport Management Act goes under discussion later this year – presenting the petition on behalf of the signatories gives them this opportunity to speak. Amazing how precarious island life is when one of its key infrastructure elements is taken out of action for a length of time. Last Saturday night the Woolworths supermarket suffered fire damage to the extent that the supermarket will be closed for at least 2 to 3 weeks and will not be fully operational, like, probably ever or before a new one is built in Ostend in about 2 years' time. It is of course hardly a civil defence emergency, and various other market players have stepped up to fill the market demand for shopping services, including Woolworths itself, which is for the first time offering online shopping to Waiheke (the island being the only area in New Zealand deprived from such service before - you could get your groceries delivered to Stewart Island but not Waiheke). The other online shop, FoodDirect, is island-run. The transport companies are doing their bit too, with Sealink's fortuitous June $50 open return offer (unrelated to the fire) now extended for July too. Fullers is doing a shopper's fare too (a reduced fare return for the 10am to 3pm sailings, with a free shuttle to the supermarket thrown in). I can't actually find that deal on the Fullers website but it's mentioned in a NZ Herald report. It is also unclear whether this shoppper's fare will be retained now that the supermarket has reopened. Amazing what competition can achieve. UPDATE: Now that the Woolworths supermarket has partially reopened the internet service has been cancelled by Woolworths. Auckland local authorities have trimmed the budget for a new integrated ticketing system for local transport and now plan to borrow to fund the project. Yesterday, the Auckland Regional Council (ARC) decided to borrow $15 million and deliver what its chairman, Mike Lee, descibes as an "economy model" integrated ticketing system to allow commuters to travel across the city on different modes of transport with a single ticket. However, the plan still depends on further funding being granted by the New Zealand Transport Agency (NZTA). "We're putting the ball back in the government's court." This is an issue that even a super-city structure will have trouble with setting up, implementing and running, given the balkanised set up of public transport systems in Auckland. Tha aim of an Auckland Oyster Card should be: all systems, all passengers, all times, all routes, all areas. And to include all Waiheke public transport. Fullers is looking to expand its reach over the harbour ferry business by buying its competitor in the commuting, cruising and touring business. Kawau Kat Cruises offers services from the CBD to Gulf Harbour and Coromandel, apart from tourist cruises to Kawau and Tiri Tiri Matangi. Fullers Group has now lodged a clearance application with the Commerce Commission to buy Kiwi Kat Ltd, which operates Kawau Kat Cruises. The consolidation in the ferry business continues apace with this further setback to any possibilities of ever getting a viable competitive service. Let's see whether the Commerce Commission is more than a rubber-stamping watchdog. The Campaign 4 Fair Ferry Fares has launched a public survey to gauge usage and opinion of the various public transport modes and infrastructure available to them. The survey is anonymous and open to anyone who uses Fullers, Waiheke Bus Company and the wharves. Please feel free to take the survey via this link. Half Moon Bay Fullers ferry users group (HMB FUG) were treated to an afternoon of cake and cruise to celebrate 10 years of ferry linking between the eastern suburbs and the CBD. More than 100 guests boarded the ferry for a celebration cruise organised by the Half Moon Bay Ferry User Group in conjunction with Fullers. The afternoon was spent sailing to the southern end of Waiheke Island and back to Motutapu, where passengers disembarked to visit the Reid Homestead. A barbecue on board followed and an anniversary cake was cut. Since the first sailing by City Cat, patronage has grown to the point where most peak-time commuter sailings are close to capacity, says Cheryl Williams who chairs the ferry user group. The group was formed in collaboration with Fullers in 2006 in response to the need to deal with matters relating to the service. As a result the group has successfully campaigned for the installation of a shelter, improved car park lighting and the continued service by Fullers. A monthly pass costs $226 for Half Moon Bay. The distance travelled isn't much less than to Waiheke but a Waiheke pass costs almost 50 per cent more (inclusion of Stagecoach bus service is irrelevant as Half Moon Bay passengers can buy a Howick & Eastern monthly all-zone bus pass for $159 instead and be done with the ferry). The Half Moon Bay service attracts an ARTA subsidy. So congratulations on the Howickeds and Pakurangutans for their affordable service, not least the successful ARTA screwing down the subsidy demanded by Fullers last year. Now where is our cake (and affordable fare to go with it)? The Commerce Commission released its long-awaited report into the electricity market. It concluded each of the four big generators - Meridian, Contact, Genesis and Mighty River - has been exercising the power the market's design gives them to command unjustifiably high prices, at least during years when inflows to the hydro lakes are low as they were in 2001, 2003 and 2006. It would be easy to substitute the company names with the company that holds a monopoly position on the Auckland - Waiheke run, and come to the exact same conclusion - which the Commerce Commission actually did when asked about monopoly practices by Fullers a few months ago, giving it a clean bill of health since "it was a lawful and rational exploitation of the opportunities the market gave" Fullers. And it is interesting to see that monopoly pricing behaviour is following a general pattern: that sweet spot you are striving towards as a company when you can charge more than general inflation. Monopoly implies absence of alternatives and thereby inhibits freedom of exchange. Monopolies exist because of failure to create a "real" free market, because of "market inefficiency". Dynamic changes are highly likely to undermine monopoly and there is at least some chance that these will be allowed to have their effect." A productive and informative meeting was held at the Ostend Hall last Saturday on the transport issues on the island, prompted by a good amount of activism, animosity and law changes over the past 6 months. Good to see a big variety of people and organisations represented, including FUG, Waiheke Bus Co and Sealink, despite a dearth of politicians and policy makers. A big boo to ARTA for not showing up. As the public transport regulator in Auckland it should be their priority, being at the heart of the problems and the solutions, to step up. A wide variety of topics got briefly discussed or mentioned or debated and it was hardly a "Fullers-bashing" session some have described it as, and who probably were never there. Despite there being no-one from Fullers, I'm sure they got a detailed briefing on what was said by whom. The next steps for C4FFF is to get the petition to the ARTA and parliament to get things moving under the Public Transport Management Act. And the survey, which is still available for responses (see link in the blog item at the top of this page) and which will be collated and analysed for public use. An Auckland man who jumped from the Devonport Ferry on the North Shore on Sunday afternoon has died in hospital. He has been named as Simon Johnston, 53. Mr Johnston rushed through an exit door and attempted to jump off the ferry, back onto the wharf, while it was leaving the terminal shortly before 4.30pm on Sunday, witnesses told police. A Fullers crewman alerted the rest of the crew, then put on a lifejacket and jumped into the water to help. Mr Johnston was rescued from the sea by the Coastguard and resuscitated, before being taken to North Shore Hospital for treatment to a head injury. Police interviewed a number of passengers and witnesses at the terminal who confirmed the man was a ferry passenger who had attempted to jump to the wharf. Simon was until last year the editor of the Waiheke Gulf News, and you can read a selection of his work on the Gulf News website. He was also an accomplished musician who often, after a hard day's work, played his guitar at many Waiheke social events and venues. If you have any particular memories of Simon, you can share them on his Waihekepedia page. Community Consultation for future fare rises is a must! Make Fullers Accountable to ARTA and the Waiheke Community. This petition is supported by the Campaign 4 Fair Ferry Fares and the Better Bus Action Group. If you want to help us collect signatures please print out this petition. I seem to strike particularly terrible bus drivers on Waiheke. They are either late, don't know where they are going or batty. On Sunday night getting slow route 3 home to Surfdale I expected to get off at a bus stop in Wellington Road. But instead the driver went straight ahead to Ostend without making the customary detour through East Surfdale. When remarking to him that he forgot to turn left he said that the detour is "optional" and I should have asked him before we started at Matiatia. I had never heard of optional bus routes on Waiheke. Are there many of them? Is the Waiheke Bus Company really a taxi company and if you ask the driver nicely he'll drop you off at your door? (Considering the huge fares the WBC is charging, the taxi companies in many cases in price-competitive against the bus!) Or does "optional" mean "when the bus driver can be bothered"? I was also wondering how long passengers at "optional" bus stops have to wait until a bus appears. We mustn't forget the other end of our commuting ordeal, the wharf system in Auckland City, which is maintained and financed by (mostly) the passenger levies on Waiheke travellers. The dispute between Auckland City and Fullers over the wharf tax (which is in practice a "departure tax" similar to what used to be levied separately at Auckland International Airport) is still ongoing and unresolved and still being collected by Fullers and still sitting in a high interest earning account. But that isn't the subject of my entry here. This morning the 8am Superflyte docked at the western end of Pier 2, where the Halfmoon Bay ferries depart from. It has for years had an impressive double gangway, complete with a somewhat aesthetically pleasing canopy and hydraulic floatation and levitation devices. The problem is that it has been months (I can't recall the last time) since it has last been used by disembarking passengers. All have to use the lower gangway, no matter how heavy the demand is, leading to delays in disembarkation. Why is this? Is it another engineering white elephant like the Matiatia $360,000 sheep run? Does anyone actually know, let alone care? Hello, come in, ARTA? Via Shirin: Local radio programme, Vocal Local, broadcasting on Waiheke Radio (88.3FM and 107.4FM), will interview Cathy Urquhart on what's going on with C4FFF. Not only has the Quickcat ongoing problems with leaking airconditioning units spouting water all over passenger seats (have these people never heard of Legionnaire's disease? ), Superflyte now has water leak problems with its system too. The middle gangway upstairs now resembles a dripping forest. At least it goes on the carpet and not on the seats.